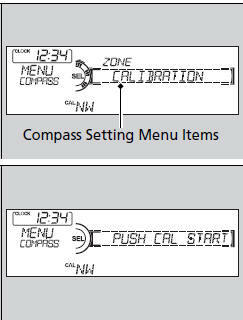 If the compass indicates the wrong direction, or the CAL indicator blinks, you need to manually calibrate the system. 2. Press and hold the MENU button until the display shows the compass setting menu list. 3. Rotate to select CALIBRATION, then press . 4. When the display changes to PUSH CAL START, press . 5. Drive the vehicle slowly in two circles. - The compass starts to show a direction after the calibration. The CAL indicator goes off. Calibrate the compass in an open area. • The RETURN button returns to the previous screen. • The MENU button cancels the setting mode.